A study of prehistoric animals has revealed the crucial role of the English Channel in shaping the course of Britain's natural history. The Channel acted as a filter, letting some animals in from mainland Europe, but not others. Even at times of low sea level, when Britain was not an island, the Channel posed a major barrier to colonisation. This was because a massive river system flowed along its bed, according to UK researchers at a palaeo-conference in Gibraltar in 2006. Today the English Channel is 520km long, 30-160km wide, about 30-100m in depth and slopes to the south-west. Even now, the bed of the Channel is incised by a network of valleys, the remains of the river system, which may have been cut by catastrophic drainage of meltwater from further north. 'It would have been an incredible barrier at times of high sea level, but it would also have been a formidable barrier at times of low sea level for populations trying to move south to north,' said Chris Stringer of London's Natural History Museum. Professor Stringer presented the results here at the Calpe conference, a meeting of prehistory experts from all over the world. The evidence comes from the Ancient Human Occupation of Britain Project (AHOB). This five-year undertaking by some of the UK's leading palaeo-scientists has reassessed a mass of scientific data and filled in some large knowledge gaps with new discoveries. Chris Stringer's co-researchers, Andy Currant, Danielle Shreve, and Roger Jacobi, have been studying how the mammalian fauna of Britain has changed over the last 500,000 years. During that period, animals have colonised, abandoned, and re-colonised Britain many times as the climate shifted from warm to cold and back to warm. The Channel is thought to have formed during a cold period 200,000 years ago or more. 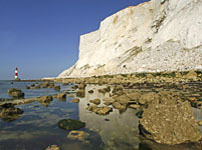 Meltwater from an ice sheet formed a lake, which then overflowed in a catastrophic flood - cutting through a chalk ridge that previously connected Britain to France. Changes in climate were accompanied by changing sea levels. At the height of an ice age, these would have been low. During interglacial periods, when the climate was warm, sea levels rose. But even when water was locked up in the ice sheets and sea levels plummeted, the rivers Rhine and Thames dumped meltwater into a major river system that flowed along the floor of the Channel. This means that once the Channel formed, there was never again a simple land crossing to be made from northern France to Britain. 'We find we're getting only a selection of the mammals during the British interglacials that there are in mainland Europe,' said Professor Stringer. For example, at one prehistoric site, researchers found hippopotamus and fallow deer; but unlike mainland Europe at the time, there were no horses and no humans. 'This suggests that the Channel, or the Channel river system, is acting as a filter to prevent the movement of some of these [mammal] forms into Britain,' Professor Stringer added. Once sea levels rose high enough for Britain to be an island, the select fauna that had made it across from mainland Europe could develop in extraordinary ways. During one warm stage, about 80,000 years ago, fossils from Banwell Cave in Somerset show that Britain was populated by some very unusual animals. These included reindeer, bison, and a giant bear similar to a polar bear. 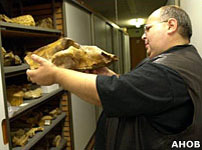 Interestingly, there are no hyena fossils at Banwell Cave, as there were in mainland Europe. Instead, it appears, their role in the food chain may have been taken up by wolves. 'The wolves were developing much larger jaws. Their teeth show incredible signs of breakage and wear as if they're chomping bones like hyenas,' said Professor Stringer. The mammals at Banwell seem to be the kinds of animals normally found today in cold regions. But they lived in Britain during a warm stage and seemed to be adapting to their new environment. The team thinks that the antecedents of these animals must have arrived in Britain when the climate was cold. But when conditions warmed up, sea levels rose and isolated Britain, marooning this cold-adapted fauna in a warm environment. Images and text copyright © BBC or affiliates. Reproduction is made on a 'fair dealing' basis for the purpose of disseminating relevant information to a specific audience. No breach of copyright is intended or inferred.